In an earlier blog post I said that I disagreed with Kaffe Fassett and Brandon Mably on one point that they made during their workshop and lecture. Each of them said that knots are okay and that you shouldn't show the inside of your knitting. I could not disagree more. If you care enough to knit something, put the time and money into it, why wouldn't you want it to look good, inside and out. It takes very little extra effort to join and weave in new yarns. Besides, knots could come undone unless the sweater felts a little. I believe that if you are proud of your knitted project, be proud of both sides. If someone wants to see the inside of my sweaters I won't say, "sorry, but I don't show the other side of my work." 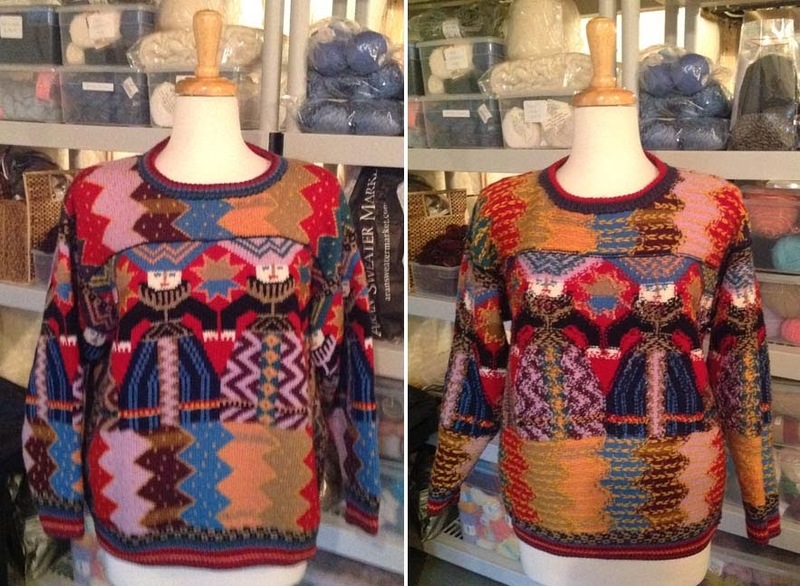 To prove my point, here are a couple of sweaters, designed by Kaffe Fassett, that I've knitted. I'm happy to show both sides and make no apologies. You can click on the pictures to enlarge them. Have you thought about sending this to Kaffe and Brandon? Might be interesting. Wonderful work! (i love seeing versions of Foolish Virgins but have never seen the backs) I very much agree with you. I often show the back of my work in my blog posts... and anyway everyone always wants to see! I made a wrap with a Kaffe Fassett pattern. The back was as important as the front, because it shows while you walk! Do it right, is what I say.